This design is a free pattern from the Cascade website. From Cascade: "Honeycomb cables add great dimensionality to a soft, sparkly cowl." Designed by Shannon Dunbabin. This design is a free pattern from the Cascade website. 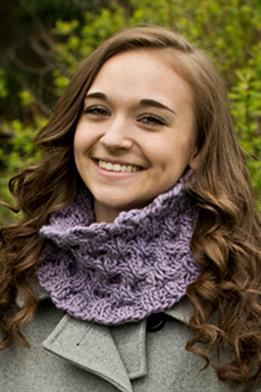 Remember to download the pattern by following the link provided on this page, as it will not be shipped with the yarn. Size US 11 / 16 - 20" circular knitting needle (or size to obtain gauge), cable needle, yarn needle, and a stitch marker needle are required but not included. Finished Size: 6" x 18". Color shown is #06 Chalk Violet.